Northern Privet Hedge For Sale - Low Prices Online Now! It provides wonderful privacy and can be grown to be several feet tall! Northern Privet Hedge is an ornamental shrub that is one of America's fastest-growing hedge producing shrubs. Northern Privet Hedge, the image comes to mind of the classic neighborhood “grass fence” that running along a house or driveway. These branched borders are often privet hedges or ligustrum in Latin. This plant is, scientifically, classified as a shrub, with the common name of common privet. Several logical reasons factor into the privet shrub being chosen for a hedge. This sturdy shrub is resilient to pollutions and other sensitivities common in plants. They endure in a range of hardiness zones and can grow under anything from partial shade to full sun. Although they prefer moist soil, privet shrubs can also grow inflexible soil pH and water levels. These hedges are especially useful in urban areas like the mid-west, where there is not only a fair amount of pollution but also salt on the roads for a large portion of the year. Northern Privet Hedge fast-growing shrub is also salt-resistant. Another characteristic which makes the Northern Privet Hedge useful as a hedge in a densely populated area is the ability to fill in when pruned properly. With a potential growth rate of 3 feet per year, the shrub can reach a mature height upwards of 15 feet and 8 feet wide, and the dense leave provide a natural fence of privacy from a bustling city street. The privet hedge can be pruned and shaped to the desired effect and should be done just after flowering. The deciduous bush is seen flowering around late spring or early summer, usually in June, sometimes accompanied by a distinguishable smell. A more distinct characteristic of this plant, versus other everyday neighborhood shrubs, is that they produce blackberries, preceded by white flowers. Privets will have different characteristics depending on the zone in which they’re grown. They can sometimes be seen with gray-green spots and creamy edges. Their list of qualities, along with their affordability, have made privet hedges a top landscaping choice. 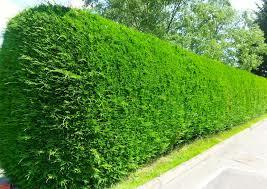 Northern Privet Hedge is commonly used in landscape design eliminating the need for a fence. The North privet is an exceptionally fast growing deciduous shrub; it grows around two feet in height each year. Sometimes the north privet can grow up to three feet a year when appropriately shared. There is no specific trimming schedule to follow when shearing the north privet. It will maintain its natural shape if shared a few times a year. It prefers no less than 4 hours of unfiltered, direct sunlight each day. The Privet grows well in most soil conditions. It can tolerate well-drained, acidic, alkaline, sandy, silty loam, loamy, moist and rich soils conditions. Once it is established, it can become drought tolerant. The foliage of the northern privet is a glossy dark green color. It is a semi-evergreen shrub. It grows pyramidal and provides a privacy screen. When sheared often it will develop thick layers of branches. The North privet features fragrant white small flowers that bloom in the early spring. These flowers usually attract butterflies and bees. One the flowers fade the northern privet then produces a dark blue colored berry that attracts birds. These droops typically form in the late summer to early fall and can remain on the privet through the winter months to provide food for birds and other small animals.